I've been looking for a decent small, lightweight sleeping bag to reduce the weight and volume I pack around. 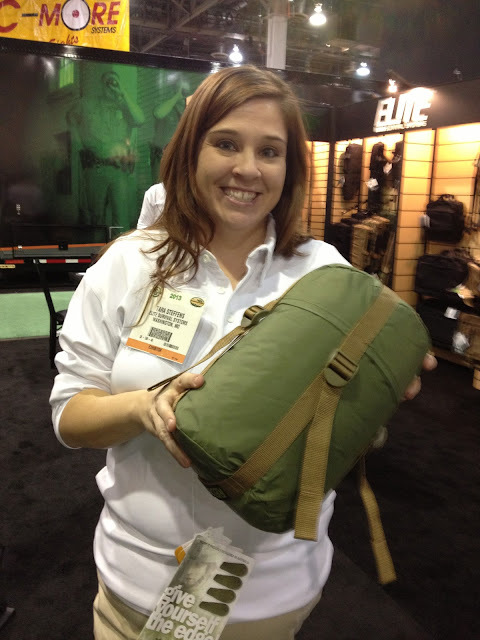 At SHOT Show today, I ran across Elite Survival Systems's booth and the line of Recon Gen II sleeping bags and was impressed. 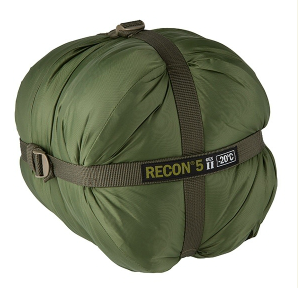 The Thermolite synthetic fill Recon 5 bag -- rated to -20 degrees C (-4 F) -- illustrated above weighs just 4.29 pounds and fits into a sphere roughly 10 inches in diameter when the spider compression sack straps are completely cranked down. Manufactured by The Kit Bag of Australia, the Recon line is on issue with the RAAF, commandos & NATO, U.S. forces in Iraq, the outer top shell is made from 210T Ripstop Nylon with a Teflon finish that reduces stains and offers a degree of water resistance on the outer shell. The outer bottom shell made is from 210D Nylon Oxford with PU2000mm waterproof finish and the inner shell is made from 210T Ripstop Nylon. The 100gm per square meter Dupont Thermolite™ Micro insulation incorporates an ultra-thin barrier of anti-bacterial pure silver micro fibre which also increases its heat retaining capability. The recon 5 sells for $223.95. I have not evaluated this, yet but am looking forward to it.